Tiger Hu Chen, The Next Jackie Chan? Chinese martial artist, stuntman and actor, Tiger Hu Chen is Woo-Ping Yuen‘s protege, the teacher of Keanu Reeves and he stunt doubled for Uma Thurman. Tiger Hu Chen is known for his work on The Matrix Reloaded (2003), Crouching Tiger, Hidden Dragon (2000) and Man of Tai Chi (2013). Tiger Chen was born on March 3, 1975 in Chengdu, Sichuan and there he studied Chinese martial arts. When he was 8 years of age, he was enrolled as a member of the Sichuan Wushu Team and he became the champion of the National Youth Martial Arts Competition and other many other competitions in China. At the age of 19 Tiger Chen moved to United States without knowing a word of English. He lived in a small wooden shack and said, “In China, at least you can practice Kung Fu and attend Martial Arts competitions, but in the United States, you will find that most of your time in washing the dishes and do a porter.” However, he did find time to compete and was an all around champion in karate. He also won gold medals in Taichi, Sabre and Staff competitions. His awesome performances in competition caught the eye of Woo-ping Yuen in and he was asked to join the Yuen Clan. In 1998, when the science fiction action film, The Matrix, starring Keanu Reeves was auditioning martial arts directors, their was a lack of confidence in Chinese martial arts by Warner Brothers’ top executives. In order to show the combat readiness of the Chinese arts, Wo-Ping Yeun asked Tiger Hu Chen to perform a fighting set and his performance impressed the executives. From this performance came Tiger Hu Chen’s first project in Hollywood. He became part of the kung fu team in The Matrix, and he trained the international stars. Tiger Hu Chen soon discovered that making movies was a difficult job and said, It’s very taxing working in this line. It’s very common that we do not have much sleep during filming. And martial arts directors and stunt professionals get injured easily; I broke my shoulder thrice, and legs twice. 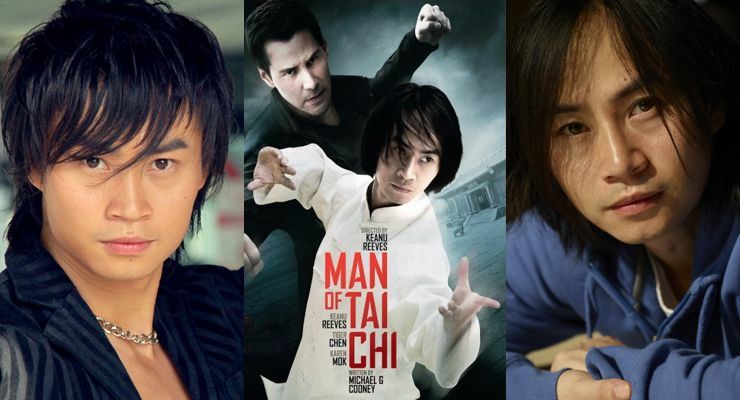 While working on The Matrix, Tiger Hu Chen became close friends with Keanu Reeves and began training Kenue in the Chinese arts. Tiger Hu Chen also did choreography for Charlie’s Angels (2000), Once in the Life (2000) and Kill Bill: Volume 1 (2003). In The Matrix Reloaded (2003), the second film of the Matrix trilogy, Tiger Hu Chen played the minor role of a Ronin, or rogue samurai. He next appeared as a martial artist in House of Fury (2005) with Anthony Perry, Gillian Chung, Stephen Fung and Charlene Choi. During this period, Tiger Hu Chen received a World Stunt Awards nominations for Matrix 2 and, as part of the Yuen Clan, for Kill Bill 2 on May 16, 2004. Tiger Hu Chen next played the lead role in Kung Fu Hero (2012), shared with Vanessa Branch and Jiang Mengjie, but his first real leading role came in the film Man of Tai Chi (2013), where he played Tai Chi Master, Tiger’ Chen Lin Hu, opposite Keanu Reeves, Karen Mok and Simon Yam. Having used his fight choreography talents in Crouching Tiger, Hidden Dragon, The Matrix trilogy, Charlie’s Angels and Kill Bill, and having starred in Man of Tai Chi, Tiger Hu Chen continues to aspire for more and ultimately he says he want to be the next Jackie Chan, although he is much too serious for that position. He does, however, have the skills to carve out his own star position.